There are several great leaps I think all newbie programmers make. The first is text input and output, then the next is reading to and from a file. One of my big leaps last year was GUI programming – escaping from the command line. 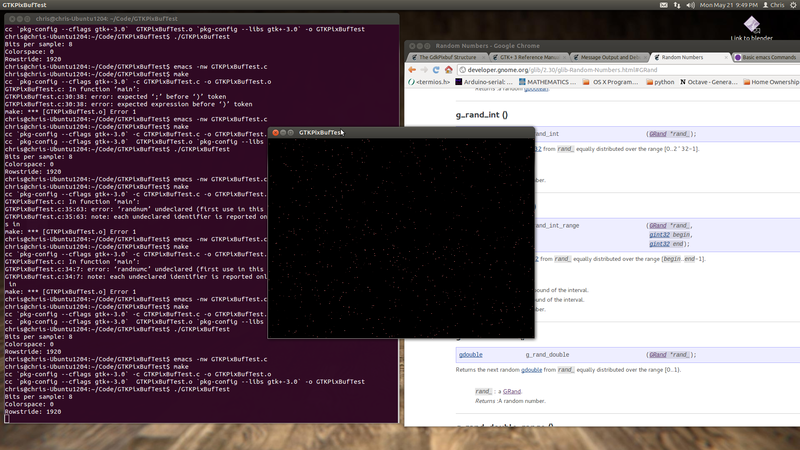 My most elusive leap has been graphics programming, but I think I’ve managed to make a small jump today. I wrote a program that randomly puts pixels in a 640 by 480 window. I’m still a bit in shock I was able to do this. The GTK/GDK documentation was fairly clear after a few things clicked – the biggest piece of the puzzle was how to address specific pixels in the data structure. I’ll certainly make a good write-up on that. There are basically NO examples of this online (and my Google-fu is pretty strong IMHO).